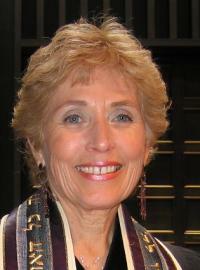 Doctor of Ministry, a graduate of the School of Sacred Music of the Hebrew Union College–Jewish Institute of Religion in New York, was invested as a Cantor in 1982. She received her Master of Sacred Theology and Pastoral Counseling Certificate from the New York Theological Seminary. In April 2010, she earned a Doctorate in Pastoral Ministry from Hebrew Union College-Jewish Institute of Religion in a joint program with Post Graduate Center for Mental Health, New York City. In recognition of her 25 years of service in the Cantorate, she was recently awarded a Doctor of Music Degree, honoris causa from Hebrew Union College–Jewish Institute of Religion. She also holds a degree in voice from Fairleigh Dickinson University. She is currently serving as the Community Chaplain for Jewish Family Service in Somerset Warren and Hunterdon Counties.